So...I'm going to be getting to the ephemeral rig stuff soon, but before I do I think I need to explain some other basic concepts, and some of the foundational ways I'm breaking with the established practices of CG animation, without which the ephemeral rig approach won't make much sense. Lets start with the big one, the most significant sacred cow I want to slay. This isn't a spline-vs-line thing, I think that the idea of persistent, always-on interpolation of keyframes of any kind was a bad idea from the start, and it's done a great deal of violence to the art of character animation. You don't see that many character modelers using NURBs, and we shouldn't be using function curves. But here we are. To be fair, this isn't a completely new idea. People have been animating purely with step keys for a while, and lots of animators block till they have a full step-keyed pose on every other frame before hitting the dreaded spline button. That a technique that basically tries to put off using interpolation--the ostensible basis of computer animation!--until the last possible moment has become so common should tell us something. But I still don't think that the full horror wrought by the function curve is well understood. I began to understand just how badly interpolation has screwed us when I started playing around with Source Filmmaker, Valve's machinima tool. 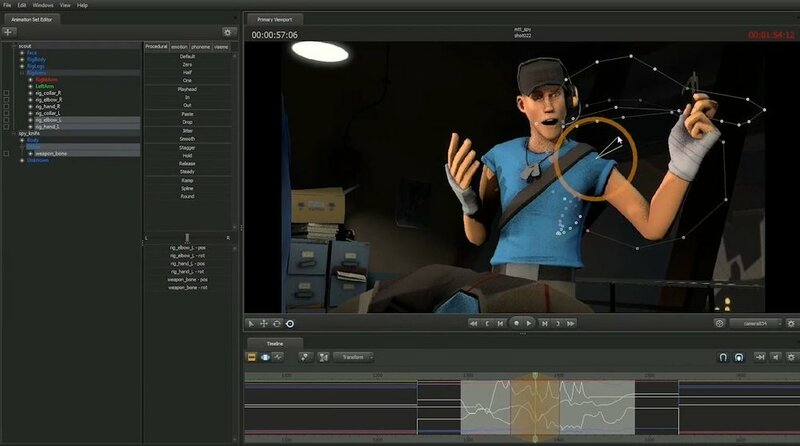 Because it's primarily made to edit data captured from a game session, Source Filmmaker deals with animation as "samples" rather then keyframes. While they are not actually keyframes, thinking of them as keyframes that exist for all controls on every frame may help animators understand how they behave. Source filmmaker treats motion as samples, rather then keyframes. It's not really a character animation package but it suggests possibilities that would be unthinkable with interpolated keyframes. With a sample on every frame and no interpolation, you can do things that would be unthinkable in the context of conventional, interpolated keyframing. Perhaps you want to edit the motion of a characters hand for a portion of the shot on which the hand is on the character's head, and you want to edit the hand in context of the head movement. You could mess around with constraints and space switching and manage a bunch of transitions between different states and controls. Or...you could just parent the hand to the head! A system like Source Filmmaker already knows where the hand is on every frame of the entire shot, because there is no interpolation to make the motion dependent on context. So it can perfectly well just calculate a new position for the hand in the space of the head for every frame. You can modify the hand in head-space in whatever way you like, then just switch it to some other space whenever that is convenient. The motion will be precisely identical in any space you put it in. The fact that we can't do this has lead to runaway growth in rig complexity. Having a lot of different ways to manipulate a character is clearly desirable, but the need to make rigs accommodate different manipulation methods and also interpolate properly leads to rigs with a million switches and dials and blend controls and additive controls. Not only must the animator think about the important stuff that is actually the job of an animator--what is the character thinking, how will they express themselves--but also how to use the overlapping controls of a modern rig to produce motion that won't turn into an uneditable mess when it's finally splined and you need to clean it up. But in an interpolation-less system...none of that matters! You can reparent controls however you like, change their pivot points, essentially just swap out one rig for another when desired. You are free to manipulate the character in whatever way makes the most sense at any given moment, and there are no consequences on interpolation, because there is no interpolation. However, Source Filmmaker is not really a character animation tool. We can't just switch to it and get these benefits. Instead, we will need to figure out how to get the benefits of interpolation-less animation in Maya. Not to mention figure out how, in the absence of interpolation, we will generate and edit our inbetweens.